The highly-acclaimed Momentum range has been augmented by a new model. The Momentum SX7i, a full range floorstanding design featuring iso-baric bass loading, an integral solid slate plinth, and Neat’s newly-developed SXT-A1 anodised aluminium dome tweeter positioned between two bass/midrange units in a quasi d’Appolito configuration. The crossover network features point-to-point hard wiring, using carefully selected high-grade close tolerance components. 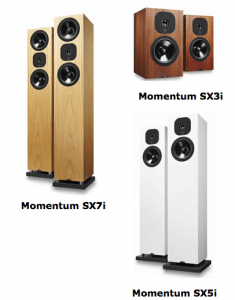 The other Momentum models have been extensively upgraded using the SXT-A1 tweeter and revised crossovers, now named the Momentum SX3i and Momentum SX5i. The SX5i also gets an optional solid slate plinth which improves stability as well as sonic performance. The SX3i and SX5i will be shipping in July. The SX7i will be available in September.